What would an advanced economy look like if technological innovation began to dry up? Economic growth would begin to slow, and we’d expect the shortage of opportunities for new, lucrative investments to lead to a period of persistently lower rates of return on capital. The prices of existing income-yielding assets would rise, and as wealth-holders hunted out increasingly rare higher yielding investment opportunities we’d expect to see a series of asset price bubbles. As truly transformative technologies became rarer, when new technologies did come along we might see them being associated with hype and inflated expectations. Perhaps we’d also begin to see growing inequality, as a less dynamic economy cemented the advantages of the already wealthy and gave fewer opportunities to talented outsiders. It’s a picture, perhaps, that begins to remind us of the characteristics of the developed economies now – difficulties summed up in the phrase “secular stagnation”. Could it be that, despite the widespread belief that technology continues to accelerate, that innovation stagnation, at least in part, underlies some of our current economic difficulties? Growth in real GDP per person across the G7 nations. GDP data and predictions from the IMF World Economic Outlook 2014 database, population estimates from the UN World Population prospects 2012. 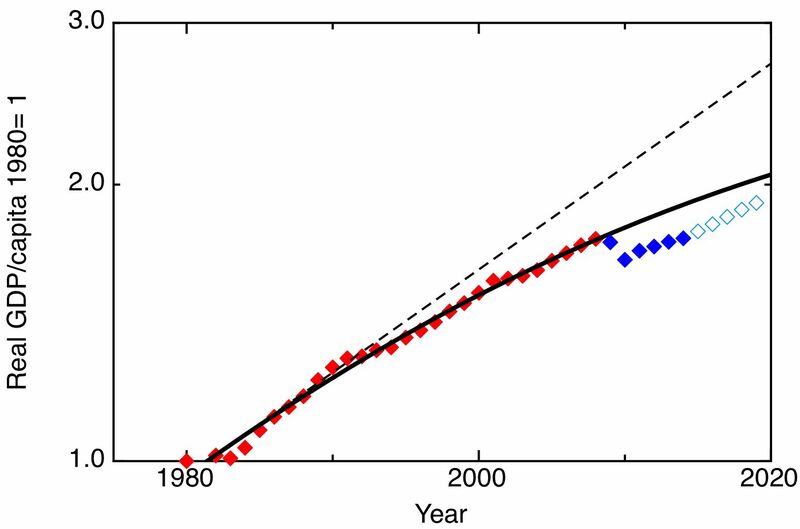 The solid line is the best fit to the 1980 – 2008 data of a logistic function of the form A/(1+exp(-(T-T0)/B)); the dotted line represents constant annual growth of 2.6%. The data is clear that growth in the richest economies of the world, the economies operating at the technological leading edge, was slowing down even before the recent financial crisis. My graph shows the growth of real GDP per capita across the G7 nations. The fitted curve is a logistic function, which describes a system whose initial exponential growth slows down and saturates.The best fit to the data between 1980 and 2007 is for a curve that begins with a growth rate of 2.6%, but for which the growth rate steadily slows, until by 2008 it corresponds to only 1.6% annual growth. The data then falls off the cliff that was the global financial crisis, and since then has failed to recover even to the slowing trajectory represented by the logistic curve. Of course, there may be, and probably are, many different explanations for slowing economic growth in the richest countries of the world. But, given the stress economists place on the importance of technological innovation as the ultimate source of long-term growth, we should ask the obvious question – is slowing economic growth a product of slowing technological progress? The obvious objection is to argue that this can’t be so, because technological progress is surely accelerating, under the influence of Moore’s law and the obvious dynamism of the information technology sector, and with new technologies such as robotics, nanotechnology, and synthetic biology yet to deliver their full potential. What’s wrong with this view is that it views technology as a single thing with a single rate of progress, whereas in fact there are many different technologies, each of which may advance at different rates. As I’ve argued at greater length before (Accelerating change or innovation stagnation? ), I think it is helpful to distinguish between innovation in three different realms – the information realm, the material realm, and the biological realm. Rapid progress in the information realm has blinded us to the fact that technological innovation is much harder in the material and biological realms. Another view (associated with the economist Tyler Cowen, for example here) is that we have already “picked the low-hanging fruit” of technology, so it is inevitable that technological progress, and growth, is slowing. It’s certainly true that some areas of technology do seem to be getting notably harder – I’ve written elsewhere (Decelerating change in the pharmaceutical industry) about the reverse Moore’s law of drug development, whereby the cost of developing a new drug has been increasing exponentially. But I think there’s something misleading about the idea that our earlier technological progress was easily won – on the contrary, since the social innovation that was the invention of formal research and development, in the late 19th century, a huge amount of manpower and resources was devoted to developing the new technologies that contributed to the rapid growth of the 20th century – in chemicals, new materials, energy technologies and electronics, to give a few examples. In some areas – notably energy technology – we have, in the last thirty years, just stopped trying, as I highlighted in this post – We sold out our energy future. The relationships between economic growth, technological innovation, and other aspect of our political economy are complex, but we do need to recognise that there is a problem here, and blind optimism that growth and technological progress will soon resume as “normal” is misplaced. But we shouldn’t be defeatist, either; this situation isn’t inevitable, it reflects political and economic choices we as societies have made. We do need more technological innovation, not just to deliver growth but also to solve our other big problems, like climate change, sustainable energy and ageing populations. We need to understand what is is about our current economic system that is causing this slowdown in technological innovation and fix it. Perhaps this is more an issue of the difficulties in getting innovations to market rather than the slowdown of innovation itself. We are getting wiser about the impact of our discoveries (environmental, toxicological etc) resulting in regulatory hurdles. And the economic slowdown must reduce angel investment opportunities as financiers become more cautious. It depends how you define “innovation” – for many people, it doesn’t count as an innovation until it makes an impact, by being brought to market for example. The point about financiers becoming more cautious is an interesting one – there is no shortage of money, in fact the opposite – there’s a surplus of savings, hence low interest rates and increasing prices of safe assets. But everyone wants safe places to put their money, not risky investments. Previous Previous post: New Dawn Fades?